Styles evolve, but good taste never changes. Well, ain’t that a fact said right? Being a restaurant owner, you exactly know the impact of gourmet food and a good taste on your customers. Over the years; your chef might change, you might choose another vendor for your supplies, the quality of the items used might vary; or a completely offbeat reason. But the fact remains, that maintaining the same taste of your menu items becomes arduous. So, we’ve brought a problem-solver for you here. RECIPE MANAGEMENT. A recipe forms the crux of an F&B business. And its effective administration is something that can’t be ignored. An accurate recipe for any dish and a perfectly followed preparation process is what primarily lies behind good taste. How does recipe management help? A befitting recipe of a dish includes the ingredients to be used, amount in which they’re to be used and of course, the preparation time. Not just that, but it also includes the number of persons the dish will serve. Similarly, when you use a recipe management tool, you most necessarily need to maintain all the above mentioned requisites and keep it updated from time-to-time. Besides, you ought to make sure that this recipe is followed every time that dish is made, regardless of the location. Enough said, a recipe management will help you in not just following the recipe and conclusively maintain the taste at your restaurant; but also let you keep an accurate record of the inventory at your restaurant. Internally connected with the inventory and stock management at your restaurant, the recipe management will aid you in tracking your consumption on a daily basis of the items made, automatically updating your inventory. Along these lines, once your stock and inventory levels go down, you’ll be notified to order new supplies; thence automating the complete process. 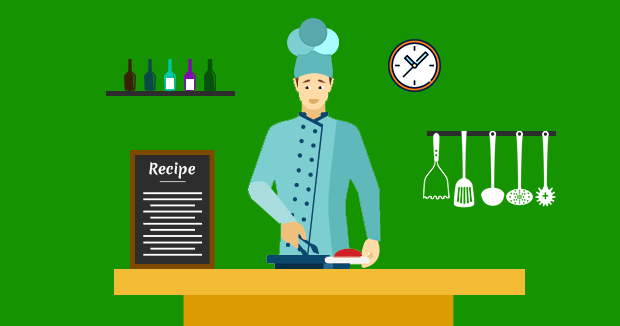 To sum things up, recipe management not only helps in preserving your restaurant’s taste, but it also plays a major role in restaurant management. In the end, food is all about balance. It is all about taste. Where does eZee come in picture? Our restaurant POS system eZee BurrP! has a solid feature of recipe management along with an extensive inventory and stock management module. Check out these in detail here. Enveloping all the features of an ideal restaurant management software, our POS system will automate and simplify your daily operations. Explore our POS system in-depth Start your free trial today! eZee BurrP! © 2006-2019. All rights reserved.